WASHINGTON — An MF Global trustee damped hopes that customers would recover all of their missing money from the bankrupt brokerage firm, telling lawmakers on Wednesday that a $1.6 billion gap remained. In testimony before the Senate Agriculture Committee, James W. Giddens predicted that clients could recoup in the “90 percent range” of their cash. Mr. Giddens, the trustee tasked with plugging the gap in customer money, has so far retrieved about 80 percent of the funds. “We’d very much like to pay every customer 100 percent, however, it will be a time-consuming, difficult and uphill battle,” he told lawmakers. Mr. Giddens also updated lawmakers on his concern about wrongdoing at the top rungs of MF Global. The dueling statements stem from the divergent missions of the two trustees, who have spent months clawing over a limited pool of assets. Bankruptcy law is fuzzy as to which group takes priority. Mr. Giddens, in charge of unwinding the brokerage arm of MF Global, must return money to customers who suffered a shortfall when the firm collapsed last Oct. 31. But Mr. Freeh, as the advocate for creditors like banks and other companies, is pursuing more than $2 billion in claims against the brokerage unit. That pursuit could give Mr. Freeh the incentive to forecast a happy ending for MF Global customers. 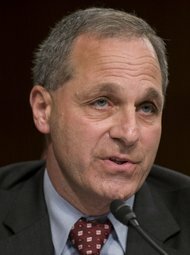 If the customers come up short, then Mr. Freeh’s effort might be seen as an aggressive attempt to deprive clients of their money. “We appreciate Mr. Freeh’s apparent support and confidence in our ability,” Mr. Giddens said, but he cautioned that the hunt for cash could yield mixed results. Mr. Freeh based his calculation on the ever-growing number of assets that Mr. Giddens has collected in recent weeks — and the hope that various courts would allow the funds to go to customers. It is even possible that Mr. Giddens will recover an amount in excess of the shortfall. The hearing on Wednesday was the latest in a series of Congressional examinations into the collapse of MF Global. After the bankruptcy, Congress subpoenaed Jon S. Corzine, the firm’s chief executive, to testify. On Wednesday, lawmakers heard testimony from the trustees and top officials at the Commodity Futures Trading Commission, including Gary Gensler, the agency’s chairman. Mr. Gensler focused his testimony on generating new measures to better protect customers’ funds. “I believe it is critical that we bring the regulators’ view of customer accounts into the 21st century,” he said. Such efforts gained new focus in recent weeks when another futures brokerage firm, PFG Best, collapsed amid revelations that its chief executive had been raiding customer accounts for 20 years. The incident was discovered this summer when the chief executive, Russell Wasendorf Sr., tried to commit suicide. MF Global’s illicit actions were discovered last fall when the firm faced demands stemming from big bets on European debt. At the time, MF Global employees tapped customer accounts to meet the firm’s needs even though the money belonged to thousands of ranchers, farmers and other MF Global clients.